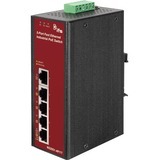 Expand your network connectivity with this rugged unmanaged 10/100Mbps switch. 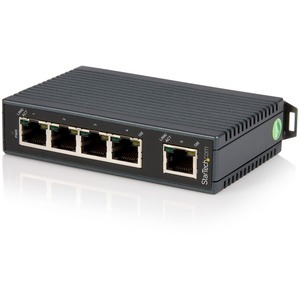 This compact 5-port industrial Ethernet switch is engineered to deliver fast, reliable network connectivity and durability in the most demanding industrial environments. It provides top performance in a wider range of operating temperatures than conventional network switches, making it ideal for factories and warehouses. Designed with a rugged IP30-rated housing, the network switch delivers maximum performance even in harsh industrial conditions. Its wide-range terminal block input gives you the flexibility to power the switch as required, based on your own power input source, while its wide operating temperature range keeps your network running smoothly. This industrial Ethernet switch is easy to install, with an attached metal bracket for DIN rail mounting on equipment racks and cabinets. Now you can eliminate the hassle of troubleshooting mismatched speed and duplex settings. This switch gives you full/half-duplex auto-negotiation and auto MDI/MDIX operation, enabling you to connect your network devices quickly and easily with little to no configuration required. With lower overall power consumption, the Ethernet switch enhances your energy efficiency, in turn helping you reduce monthly costs. The IES5102 is backed by a StarTech.com 2-year warranty and free lifetime technical support.